The best way and most natural way to kill ants is to stop them from coming inside your house. How you do that depends upon the type of ant that decides to squat in your house. I have pavement ants (also called sugar, pantry, kitchen, or concrete ants.) This tutorial will focus on eliminating kitchen ants with steps in order of importance. You can do any of these steps in any order but for lasting results please do not skip Step Three! 1. Identify what type of ant you are dealing with so you know how to evict them. In my experience not all DIY ant killers work on every type of ant. My ants laughed as they danced over the cinnamon and chalk lines I tried while others swear it works for them. The University of California Agriculture and Natural Resources Department has a handy ant ID chart here. 2. Find out where the ants are coming into your house. Sugar ants get into a home through small cracks in your foundation, doorways, windows, or pipes on outside walls. Sweet food and damp areas also draw them in. This is what I found when I removed the base molding near where groups of ants held a series of raves in my kitchen. This kitchen wall is near an outside door and is backed by a garage wall. I also found ants on the same shared wall behind the stove and under the kitchen sink. 3. 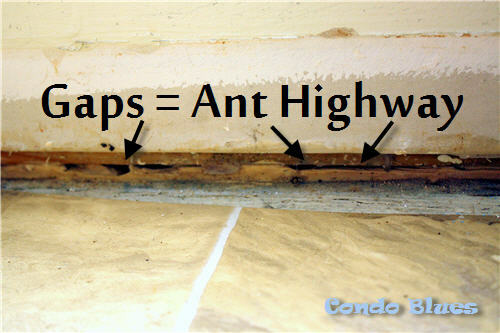 Fill the ant entry cracks with either spray foam insulation, steel wool, or the plastic equivalent of steel wool scrub pads. This is the most important step. Do not skip this step! Steel wool and cured spray foam insulation is like razor wire to ants. They don't like to walk across it or chew through it to go into your house. It worked the first time we had ants seven years ago. The only reason I kitchen ants now is they got devious and came into my house though different gaps and cracks in an outside wall. Ants are sneaky jerks. I stuffed bits of steel wool into the small cracks by hand. 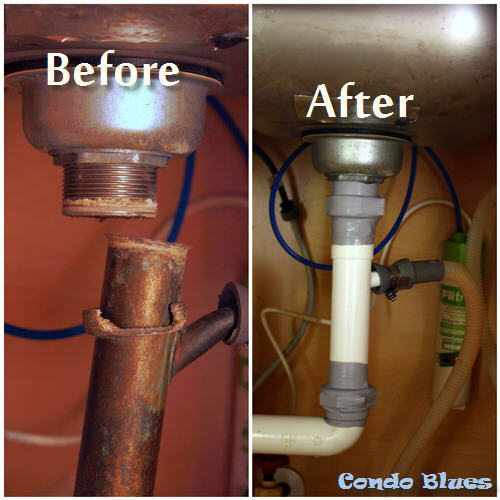 I filled the larger areas around the pipes under the sink with spray foam insulation. If you are concerned about the potential flammability of large amounts of steel wool, I have used the sharp and pokey plastic version of steel wool with good results. Ants will eat natural sharp and pokey scrubber pad material and will walk right through slick metal copper scrubby material. Don't' use them. 4. Kill the ants inside the house. Use your favorite natural method: vinegar, cream of wheat, DIY ant killer spray, etc. The only natural ant killer that works for me besides my shoe is EcoSmart ant spray. 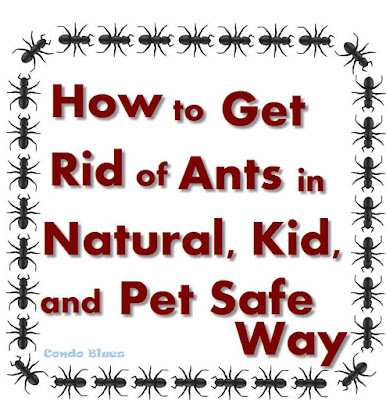 EcoSmart uses wintergreen oil to kill ants and it is peopel and pet safe. 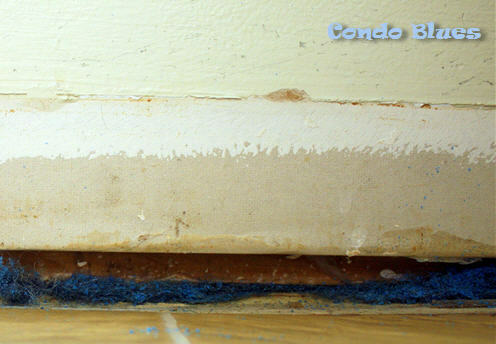 I buy and keep a supply on hand after I reviewed EcoSmart ant killer here on Condo Blues. Many people suggest mixing something sweet to attract the ants like jelly, honey, or sugar with borax that kills ants. DIY borax ant killer works but I will not use it. If you have pets or curious children you may not want to use borax. If they eat sweet DIY borax ant killer the borax may kill them or make them very sick. 4a. 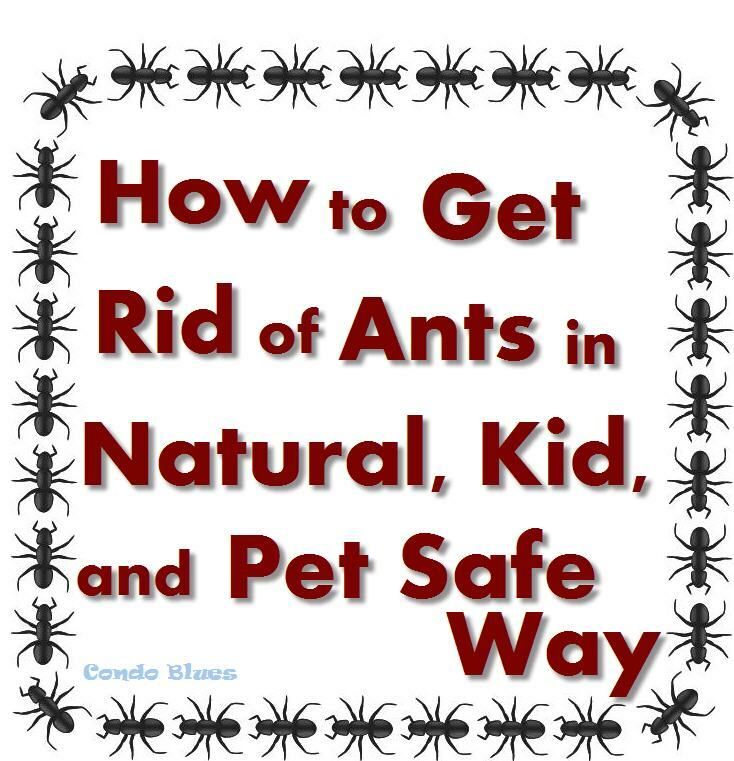 Spread ant killer around your house outside or on the colony’s anthill. I haven't use it but food grade diatomaceous earth will kill ants. It is made from a sharp fossilized algae so make sure you wear a face mask when spreading it. The pool and fish tank DE has different ingredients and won’t work. I buy EcoSmart Insect Killer Granules here because it is cheaper and easier to use than DE. The plant oils make it smell better. Whatever you use, make sure to reapply after it rains! A leaking drain pipe made my kitchen sink cabinet damp. I replaced the leaking pipe and wrapped the joints with waterproof silicone tape for extra paranoia. I kept the cabinet doors open for a few days to dry everything out before I finished Step 3. Taking out the kitchen trash and if you have one emptying the kitchen compost bucket more often is a good idea too. 5. Store food and dry goods in containers with tight sealing lids. Last year after I had a light bulb moment and started keeping brown sugar soft by storing it in a mason jar. I made it a long term project to decanted my cupboard and pantry goods into repurposed (and some purchased) jars as empty jars and time, and permitted. I solved the canister problem once I found half gallon Ball jars hold all but one quart jar of a five pound bag of flour. Everything without a permanent label rotates in and out of the kitchen with seasonal availability. Read my 7 Ways to Remove Sticky Jar Labels here. Husband thought I was nuts at the time. He changed his tune when we got more space in our cupboards (a nice surprise! ), food doesn’t dry out, and stayed pest free during our ant crisis.